In yesterday’s post, we talked about the joy thief of excessive stress, and about finding the right balance to optimise our emotional homeostasis. Many people assume that if excessive stress leads to no joy, then having a life of no stress would be the opposite and lead to a life of untold happiness. Except, it doesn’t. No stress may feel great in the short term, but a life of absolutely no stress is a different form of malaise, leading to emotional weakness, something which is just as joy-sapping as excessive emotional strain. As I said yesterday, it’s all about balance. So how do you know where the optimum is between not enough and too much? The answer to that lies in the humble guitar string. I really don’t know a lot about guitars, but I do know that when you first put a new string on the guitar, it’s unstretched – there’s no strain on it at all. If all you did was tied the two ends of the string to the tone peg and the tuning peg, the string would remain limp and lifeless. It wouldn’t be able to do anything useful. It certainly wouldn’t play a note. When the tuning peg is twisted a few times, there is some tightness in the wire. The string is now under tension (i.e. stress). It’s now able to play a note of some form, so it can do some work and fulfil some of the function of a guitar string, though the note’s out of tune. With further tightening of the string, the perfect pitch is lost, but the string can still produce a sound of some form. With more tension, the string can still make a noise, but it’s off-pitch, and on a microscopic level, the fibres inside the cord are starting to tear. If the string were wound further and further, it would eventually break. Each of us has our own particular point where we are in tune. When we know where our sweet spot is, we can operate within it, achieving our best in life without doing ourselves harm. This is the first point that we need to identify on our own personal stress/productivity curve. This is the point of maximum productivity. We also need to understand that a bit more stress is ok. It’s inevitable that we are going to be stressed beyond what we usually cope with at times. Without that challenge, there would be no growth. Challenges usually hurt. You can’t have growth without pain. Our muscles adapt and grow when they are pushed just beyond their optimal load. The key is learning how far we can push ourselves before we start to falter and fail. 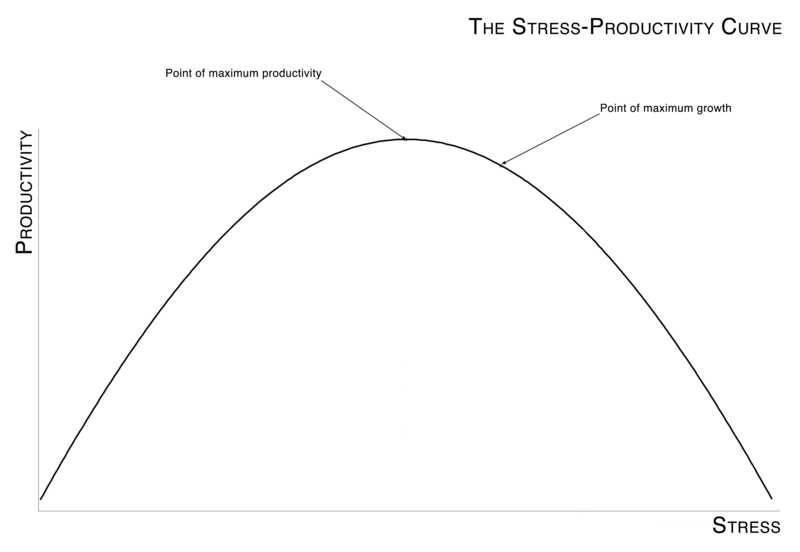 This is the second point we need to discover on our personal stress/productivity curve. This is the point of maximum growth. We understand where these points are on our own personal stress-productivity curve when we listen to our inner selves and learn from our mistakes. Once we have found our own note, we can sense when our bodies and minds are starting to stray outside of our optimum performance, to listen when we’re not quite in tune. Joy is much more likely to thrive if we are playing our own notes in tune, striking the right chord. This entry was posted in Psychological, Social and tagged balance, chord, growth, guitar, joy, malaise, muscle, pitch, productivity, stress, string, tune by cedwardpitt. Bookmark the permalink. To stretch (pun intended) the analogy further… musical instrument strings don’t just stay in tune once you get them pitch perfect. Violins are a good example to use, as they are more sensitive – more highly strung, you might say (groan) – than guitars. They constantly need tuning – every time you play. Changes in temperature and humidity, being bumped and all manner of other things can put them widely out of tune. Fine tuning can be achieved using adjusters (near the violin bridge) but often you’ll need more drastic adjustments, using the pegs. This is akin to balancing the stress in our lives. The “sweet spot” does not stay sweet without constant readjustments – sometimes only fine tuning is needed, other times require a more drastic adjustment, especially if we are subjected to a big change in our external environment. I recall my poor violin’s objection to going from a Queensland December heat wave to a Canadian cold spell in 24 hrs – an 80 degree C temperature change and from very humid to extremely dry. It took a long time to settle down, tuning wise.